It’s the things we don’t know. As we approach our third annual Tender Lights event we are day by day preparing all the little things that are needed to accomplish such a heartwarming event. This has to be my favorite event and the one I look forward to most each year. It is at this event that I myself get to pause. It isn’t the nature of our work to talk about the families we meet each year and to tell details on each situation, all being so different and so impactful. We keep all those moments bottled up in respect for the families but we would be remiss to say that they don’t affect our hearts as well. The memories of each meeting come flooding back at this time every year and as I sit and count the lanterns this year I can once again feel those harsh moments of pain that these stories offer. As I gather the sharpies and the tealights and pack them in the boxes ready to head to the event, I remember the look of shock and the stillness of the room when we entered in one moms room this summer. She was so quiet, seemingly almost afraid to talk because she just wasn’t sure of anything in that moment. Who would be? I can remember a mother, while sad, just admiring her beautiful daughter and all those perfect parts of her. She held her so gently and smiled while she talked to her. Loving her daughter in her pain was all she knew to do. I wish even now I could help them. I move over some of the wedding dresses that so many women have graciously donated and pull out our box of t-shirts to take inventory again. I see an impression kit, misplaced and away from the others, and as I hold it, I see a mom who couldn’t bring herself to even look at her full-term babies footprint we had just moments before taken for her. She wasn’t ready and my heart just aches. The pain surges through me and my breath is stollen while tears begin to well up. I grieved so much with her, and still do. Isn’t that truth? If we rely on our own strength we’d never make it. It isn’t ours as mothers, fathers, and loved ones. It isn’t ours in Tender Mercies. We fall apart too. We leave the room and we cry. We talk to God and we remember the moments. Every one of them. They build, each and every one, so gut wrenching and never understood. We reach out again, and again, and again. Then, we love. There is nothing more important than to love. Especially in the stillness. It all floods back. The hard times, the good times, and the emotion in all of it. We look forward to Tender Lights just as much as you do. We get to share in a memory that means so very much, every single day, to you and to us. We are with you. Then. Now. Forever. Our prayers are that anyone ever touched by a visit, an event, or even a simple letter would have a moment with God that gives them peace and love. We pray that he gives little loving moments through others, images, or in things you see or smell. We pray for moments that we don’t know about. It’s the things we don’t know, but we hope for, that God gives each and every one of you as a tender mercy. We’ve come a long way since we started Tender Mercies last June. In the last nine months God has guided our hands in helping others during the loss of their child(ren). We’ve been a source for memory boxes and other cherishable items donated to the parents and families, we’ve hosted our first of many memorial events, and we’ve been able to meet with and talk through some of the most heartbreaking stories ever told by grieving parents. We have made life long friends through this foundation and we have started to open Southern Illinois up to a new community of support. With your support and God’s will, together we have been brought to a place where we will be able to help families for a long, long time to come. There is no doubt though that God has so much more in store for Tender Mercies and Southern Illinois. Things we probably can’t even imagine right now. One of our long term goals since we started TMFSI was to provide a safe and comforting resting place for children sleeping in Christ. It is one of the hardest things a parent will ever do to lay their child to rest, but we know just how important those moments are. It is more likely that parents will be faced with the decision on where they might bury their child only moments before or after their passing than it is that they have a plan in place for such occasions. Some have family plots that are available to them and some have not even had the discussion for themselves, let alone their children. There are visitors to our area that do not plan to stay. There are those that simply cannot afford to purchase a forever place their child. This is why we are excited to build Tender Gardens, a resting place for children and babies in our area. We envision a beautiful garden with the most peaceful landscaping. Imagine a weeping willow blowing ever so softly in the wind and the flowers of spring and summer bringing a little peace to the soul as you take one step after another into a world you hoped you would never see. A fountain that you can hear gently in the background flowing peacefully like a creek winds through the rocks and then throughout there are statues reminding us that our babies are safe and home in Jesus’ arms. Tender Gardens will be a peaceful place. A place where you could sit and hear natures lullaby keep you while your sweet baby sleeps. God has placed the vision of this tranquil place in our hearts to offer to anyone that may need it. This year we have found that those we’ve been able to touch through Tender Mercies, as well as those that have been affected in the past or through others stories, have found it in their hearts to help us in our mission to grow Tender Mercies and all God calls us to do. We have decided that any donation that has been made as a memorial in the name of a loved one will be dedicated to funding Tender Gardens. We would like to honor donations and will promise to incorporate them into the gardens in some way. At this time we are in the very beginning stages and we are currently searching for the perfect property. If you have, or know someone might have, two to three acres available we would be interested in talking with you. Once we have the site chosen we will th en begin designing the garden and begin our fundraising efforts to accomplish all that such a garden requires. In the meantime, we will continue doing what God has called on us to do and be there for those that need us. Thank you to anyone who has ever shared one of our posts, talked with others about Tender Mercies, attended an event, sponsored and event, donated your time and talents to making the memory items that are so special for the families, and especially those that keep us in your prayers. You have made all the difference and have allowed us to be there for others we may have never had an opportunity to otherwise. May God bless you all. The day was beautiful despite the gamble we know October weather can bring. The sun was shining, the wind blew softly and you could hear the fallen leaves wrestling on the ground. 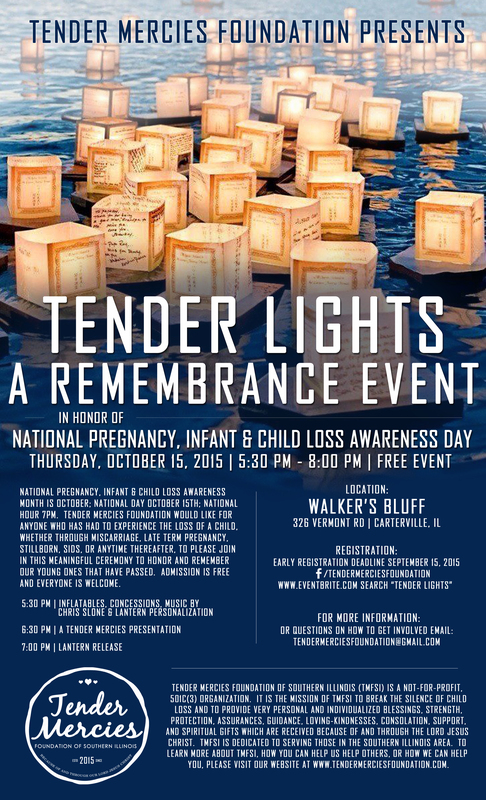 It was a perfectly wonderful Thursday evening in a Southern Illinois October that we received for what would become the first Tender Mercies remembrance event. You could hear laughter as the children played on the grounds and you could see hugs everywhere you turned. Anyone could have been pulled into the moment we were sharing that evening. As night fell you could begin to see the soft candle glow shine so sweetly on the faces of the families as they released a lantern for their child(ren). Sure, tears fell, but only if you were there could you truly realize that those tears were good. They were healing and some had finally made their way out after having been pushed so deep, for so long. Then, small tears of joy from heaven fell in the form of raindrops and not one person would mind. We smiled. We embraced it and we found peace. When we started Tender Mercies Foundation in June we had visions of helping others. At first it was by providing memory items and perhaps monetary support to families planning their goodbyes. It was very clear that they would appreciate those things but sometimes, just sometimes like these, we need a way to acknowledge that we hurt and that our child was gone. October 15, 2016 gave us that. It gave us the proof that the pain is real, wide-spread and needing an outlet for healing. We now know that there is no greater gift than acknowledgement. We hope that you are able to enjoy this first round of pictures of the evening by Whimsey Photography. These pictures may be used however you wish. We do ask that you consider tagging us when used on Facebook so that we can help bring awareness to this cause. Until next year, God bless and keep you. IF IT DOESN’T SCARE YOU; IT ISN’T WORTH IT. Or at least that is what we kept saying as we headed towards the local radio station to promote Tender Mercies and the upcoming remembrance event this morning. If we are to be completely honest and transparent here, we are just learning how to speak at public events and in promotional situations. It is not our second nature. We are so very grateful for the opportunities to talk with others at our events and to thank guests for their attendance and also to offer a piece of what TMFSI has set out to do in its mission. We are thankful for moments like this morning when we are able to reach thousands of people over the air to help encourage attendance at our events that are designed to support and lift those up that are grieving. It does not escape us that we do have a long way to go with what may be considered a proper delivery of information, but we promise we are working on that. In the meantime we will continue to pray, practice and put ourselves into these positions because no matter the delivery, the information is important. It is truly more important then the nervous hands, butterfly stomachs and shy voices. To help others is not something we are willing to second guess. We will push and with God’s help, we will become more comfortable in this. Until then, we ask for your grace and acceptance and encourage you to look past our nerves and open your heart to the mission of TMFSI. We can’t lie that the last month has been a little insane for us at TMFSI. It is an exciting thing to see the outpouring of support we have seen from the area and in the attendance at our fundraising events. Due to the overwhelming response to Painting with Purpose, we hosted Painting with Purpose – Round 2 on August 22nd where we also had another astounding response. With over 70 women in attendance we had such a wonderful time and were able to raise over $1,600 for TMFSI. Again, we wouldn’t have been able to do it without our sponsors, Chris DeShazo of Spectrum Graphics and Von Jakob Vineyards. 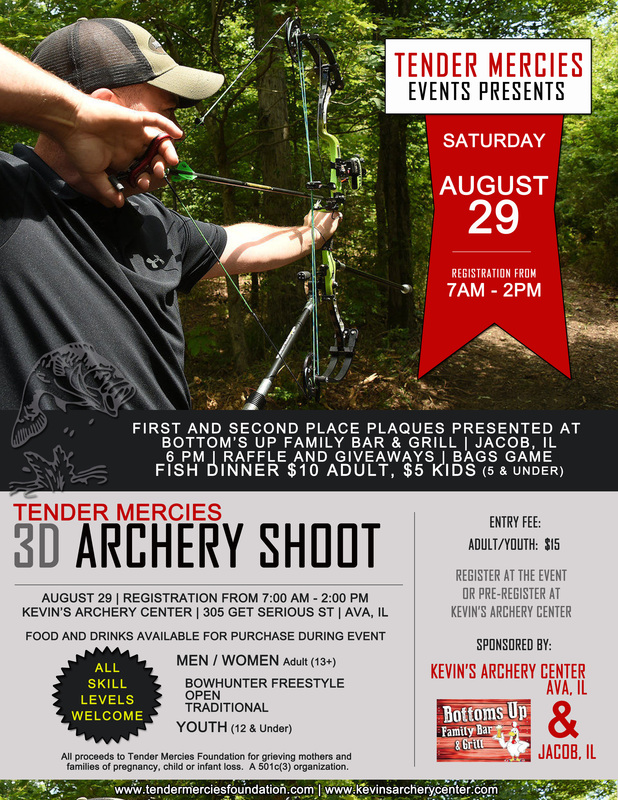 On August 29th, along with Kevin’s Archery Center in Ava, IL, TMFSI hosted our first archery tournament. It was a wonderful turnout with 46 shooters! Followed by a fish fry the event raised just over $2,000. Thursday, September 25, 2014 was a morning not unlike any other fall morning around our home. The crops were ready to be harvested and I was working on the final touches of what was to be our daughter, Blair’s, nursery. I fought back the nagging worry that something wasn’t right and double checked my hospital bags and prepared the car seat to install after returning home from what was to be my last routine appointment before our pre-op appointment the following week. Blair was scheduled to be delivered via repeat c-section on October 8th, just three days before her due date but the on again and off again contractions I had been having over the last few days told me she had other plans. I dropped our son, Wade, off at my mother in law’s and made my way to Carbondale. Upon entering the room I can recall the first thing I told Kelly, my NP, was that I was almost worried over the weekend because I hadn’t been feeling Blair like I had been. Because she was breech, had dropped, and the age old myth that babies slow down at the end, I stuffed my fears away and decided that I was still feeling her move, it was just different. The moment Kelly put the Doppler on my swollen belly and I heard nothing but silence I knew my worst fear had become our tragic reality. Holding on to hope she grabbed a different Doppler and checked to see if they could get me in for a quick ultrasound. I held my faith that we would get in there and see her wiggling away and we would all laugh about the scare she gave us. As we walked down the hallway to the ultrasound room it hit me. In one moment I nearly dropped to my knees and everything became blurred. I can remember Kelly asking me who she could call just in case, giving her Matthew and my mothers numbers, and the deep fog that began to settle in. The moment they put the wand on and our daughter came up on the screen my world came crashing down. In one statement, five words, my life would never be the same. Our little girls heart had stopped beating and for the time being we had no clue why. My family arrived, joined me one by one in sorrow, and we began discussing what our options were. Matthew and I chose to go home, digest what was happening, and to call when we had made our decision. By that evening we had decided to go ahead and schedule the c-section for the following day, Friday, September 26th, at noon. We spent the evening with a house full of family and friends unsure of what to do but surround us with their love. By eleven that night everyone had cleared out and I was trying to get some rest when I noticed the contractions had began to pick up. After timing them for an hour they were as far apart as eight minutes and as close as four minutes and I called Dr. Gates at 12:17am to inform him of what was going on. They weren’t very intense and he suggested a hot bath or shower to see if that slowed them down and if not to come in. As I drew my bath water I noticed some changes that told me we needed to go. In a matter of no time they quickly picked up and we where on our way to the hospital. One of my sisters-in-law was in the car with us and decided to call an ambulance who requested we stop and wait for them. I told Matthew, no way, we will never make it. As we came into Carbondale my water broke and in an instant Blair began to make her way into this world. We met an ambulance who rushed me the final blocks to the hospital where Blair would finish her birth at 1:33am on September 26th. After she was born it was clear what took our darling daughter from us. She had a perfect storm of cord issues that came together in the worse way. Her cord was wrapped around her neck three times and she had a very tight knot in it. She was perfect and beautiful in every way. Holding the lifeless shell of our daughter I knew in that moment she would always be a part of me. Though she would never take a breath on this earth I would breathe every day for her. Her short life gave me so many wonderful gifts. The grace and the compassion to be able to live life as completely as I can. Through our faith and our family we have turned our darkest days into something so bright and beautiful. Because I live, Blair lives and each day she gives me the strength to put one foot in front of the other and rejoice in knowing that one day we will be together again. Megan shared her story with the group last night and left us all in tears, as you can imagine. She reminded us, once again, why we are doing this. It was when she announced that she would like to continue Blair’s Cuddle Run through TMFSI, she had funds left over from the first event and that she would like to donate them to TMFSI, that the only sound you could hear was tear drops falling. 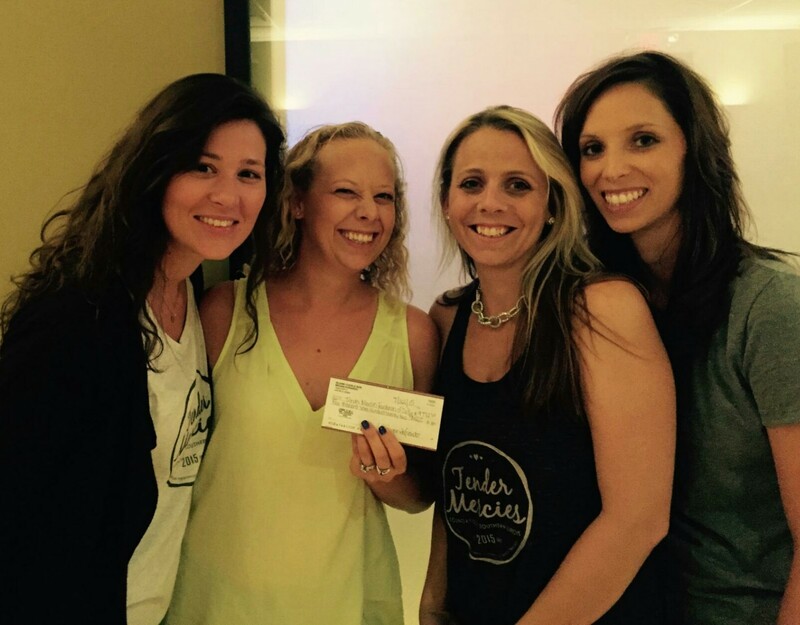 Megan gave TMFSI a check for $4,772.89! Speechless. We are very excited to work with such an absolutely wonderful person. If you get a chance to meet Megan, you will surely understand why. When considering what it would take to make Tender Mercies Foundation a success, we all knew that fundraising would play a very important role. Without the help of others we knew that we wouldn’t be able to fulfill the purpose we set out for. We knew that doing this would take a lot from us. A lot of time. A lot of effort. A lot of ideas. We knew it was worth it. It wasn’t long before we were throwing out fundraiser suggestions though. One of the first ideas was to have a painting party. Lauren talked with Christine Deshazo at Spectrum Graphics, Kyle Fager at Brews Brothers Taproom and Patty Koenig at Country Insurance. Before we knew it a date was set, a to-list was created and we had our very first sponsor committed. Christine had agreed to prepare the canvas’, provide the paint/brushes and teach all the participants how to paint their masterpiece. Kyle agreed to let us use the lounge at Brew’s Brothers Taproom for the event and not only set it all up, but cleaned it as well. Patty was our very first monetary sponsor. She agreed to buy all the canvas’, drink tickets and food for the event. The donations made by all three were huge and very, very appreciated. More than they may ever know. So, the invitation was posted on our Facebook page. It took about 5 hours before we not only sold out, but had a waiting list formed. We were shocked, but ever so happy. With everything lining up perfectly we spent an evening meeting with Christine to chalk the outlines on the canvas’. Talk about a blast. We had a system in place between the four of us, whipping them out one by one and unfortunately, it went all too quick. We wanted to find reasons to stay just a bit longer. Christine was the perfect hostess and made us feel so welcome. The day of the event Patty started getting everything ready at the venue. Kyle had already arranged the room so Patty, Lauren and Kelsey Blake were able to come in and start setting the tables, placing tablecloths over them and adding sweet touches like Hershey’s chocolate kisses for the girls to snack on. She brought in so much food and she even had special drink tickets printed up for the girls to use. She went way above and beyond. Kyle showed us how to get music going and all we had to do was wait for the event to start. As everyone arrived we had a chance to talk together and let them pick their seats and a picture to paint. The mood was so good and we all truly appreciated each others company. Unfortunately, at events like this someone should talk about the cause and what their participation means. I think the three of us stalled and pointed at one another as long as we possibly could before someone had to say something and start the party. I got the short end of the stick and as nervous as can be, introduced TMFSI and thanked everyone from coming. There was emotion in my nerves and while I wish I could do it over and could have been a little more eloquent, everyone was curtious and respectful. Thank you for that. In hindsight, enough credit wasn’t given to our sponsors. Thank you again Patty Koenig, Kyle Fager and Christine Deshazo. Each and every one of the pictures, while stenciled the same, were gorgeously different. To walk around and watch each painting come to life in such unique ways, showing a piece of each of the artists, was an honor. It is something to appreciate. The diversity. The appreciation of others ideas and styles. The camaraderie. In all, we were able to raise $985 for TMFSI that night but not without each one of you and our sponsors. Thank you to anyone who participated or sent donations with friends. Thank you Christine for sharing your talents and time. Kyle, thank you for providing us such a wonderful place to gather and for the donation on top of it. And, Patty, thank you so much for purchasing all of the canvas, drinks and food. Together, we touched many lives not only that night, but many to come. 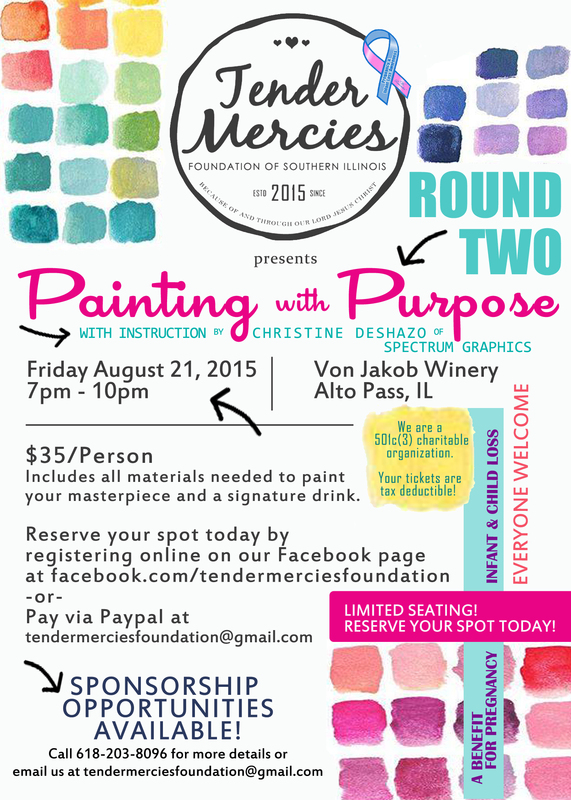 Stay tuned for “Painting with Purpose – Round II” on August 21, 2015. Until then, here are some photos taken from the event. Enter your email address to follow this blog and receive notifications of new posts and happenings by email.